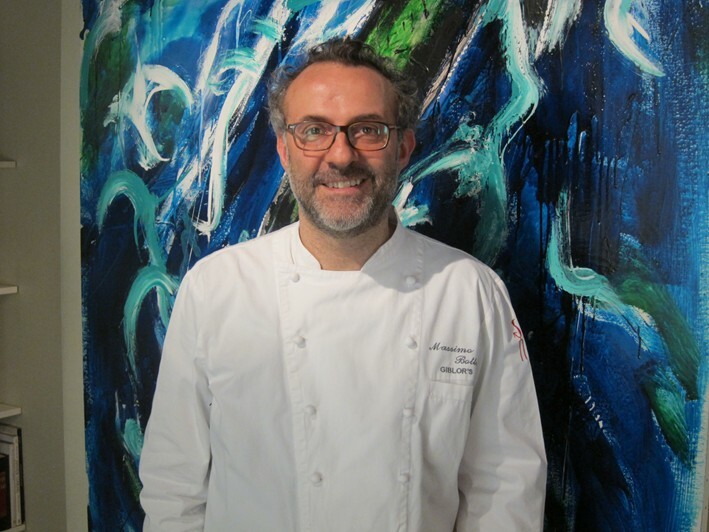 Massimo Bottura is chef/patron of Osteria Francescana, which in 2012 was awarded its third Michelin star. This restaurant is in Modena, which these days is famous as the home of Ferrari, but also has a university dating back to 1175 (older than Cambridge, but a little younger than Oxford). The town is situated in the Po valley, just over 100km south of Verona. 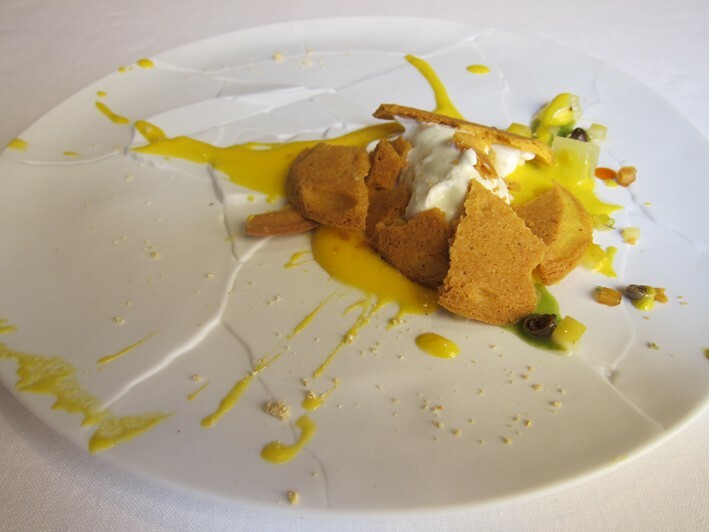 Chef/patron Massimo Botturo has worked in his past at both Louis XV and El Bulli, experiences reflected in his modern cooking style but also his grasp of classical cooking. 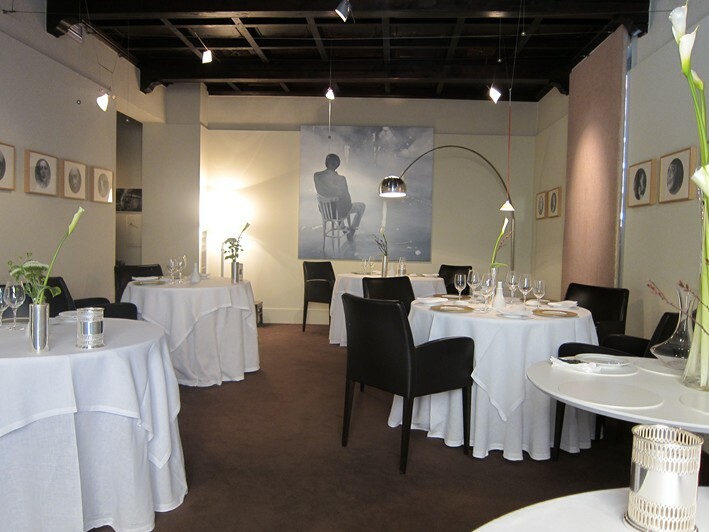 His restaurant, which opened in Modena in 1995, gained two Michelin stars in 2006, and a third in the 2012 guide. The restaurant is tucked away in a quiet side street in Modena. You pass a waiting area with a well-stocked bookcase of cookery books on the way to the dining room, which is surprisingly small. Just six tables were set on the day of my visit, and at lunch one of these was unused, so there were just ten diners in total at this particular service. The carpeted room had framed black and white photos of movie stars around the wall, some modern art on the far wall and a beautiful display of canna lilies. 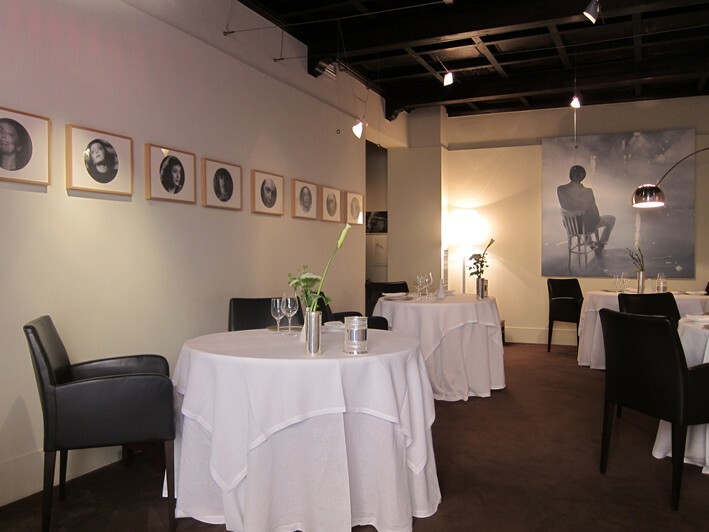 Tables were large and generously spaced, set with good quality white linen tablecloths. There were three different tasting menus available, in addition to the a la carte (which is the way we went today). These were priced at €100, €140 and €180 for the "Traditional", "Classic" and "Sensations" menus respectively. The wine list was vast, with over 1,200 different wines available. We drank the very pleasant Vigneti Massa Costa Vento Vigna Timorasso Colli Tortonesi 2007 at €80 for a wine that you can find in a shop for €34, but the list spanned the globe. The lovely Guigal Condrieu 2002 was €120 for a wine that you can buy in a shop for €52, Franco Martinetti Marasco Barolo 2001 at €150 for a wine that retails at around €62, and Trimbach Riesling Clos St Hune 1996 at a very fair €250 given that its average retail price at this time was €256. Similarly, Penfolds Grange 1997 was on the list at €355 yet retails at €339. The meal began with a dish called "Memories of Mortadella", essentially a take on the humble pork sausage from Bologna. 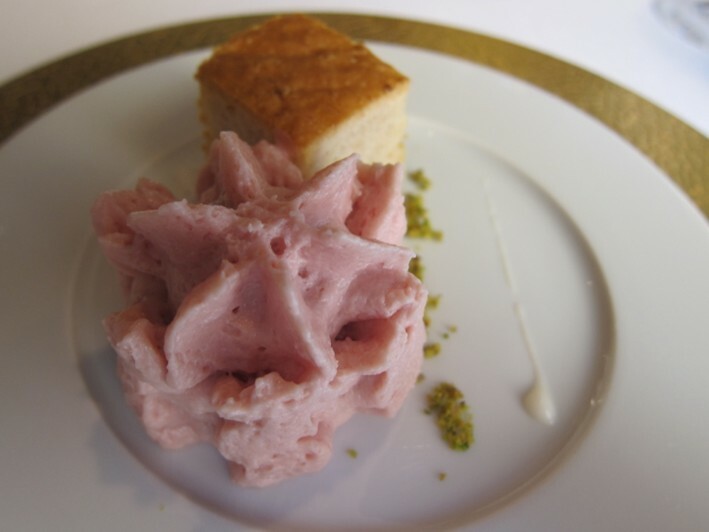 Here the mortadella was transformed into an extremely light mousse, served with pistachio and sweet garlic, and a slab of bread. This dish is a reference to the chef's childhood, since his mother packed him a mortadella sandwich every day for his trip to school. Here the mortadella is reduced to a liquid form, sieved repeatedly and then put into a siphon and sprayed onto the plate. The result was remarkably light, a sausage mousse. I was impressed with this dish, as the mousse was extremely light and yet really tasted of the sausage, an example of modern cooking technique put to good use (19/20). 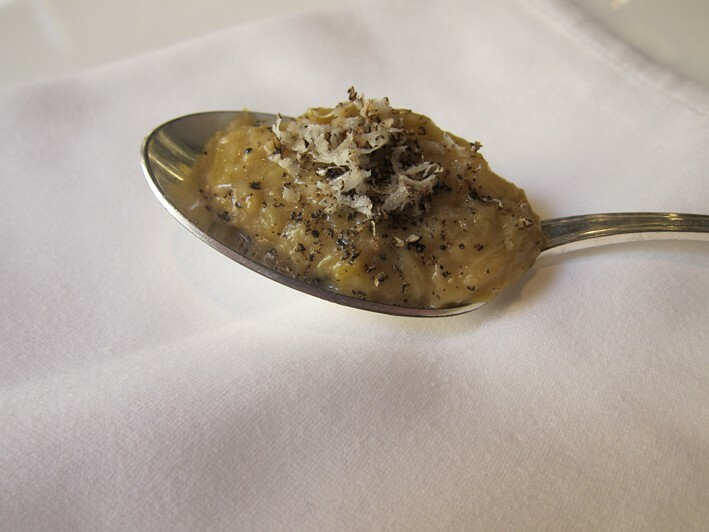 The area of Emilia Romagna is noted for several food products that involve ageing, such as its ham, Balsamic vinegar and Parmesan. Here a dish of Parmesan is prepared in five different ways. 24 month aged Parmesan is prepared as a mousse, 30 month aged as a foam, 36 month aged as a sauce, 40 month aged as a galette and the oldest, 50 month, as a Parmesan air. The warm mousse was delightful, smooth in texture, resting in a pool of the Parmesan sauce. 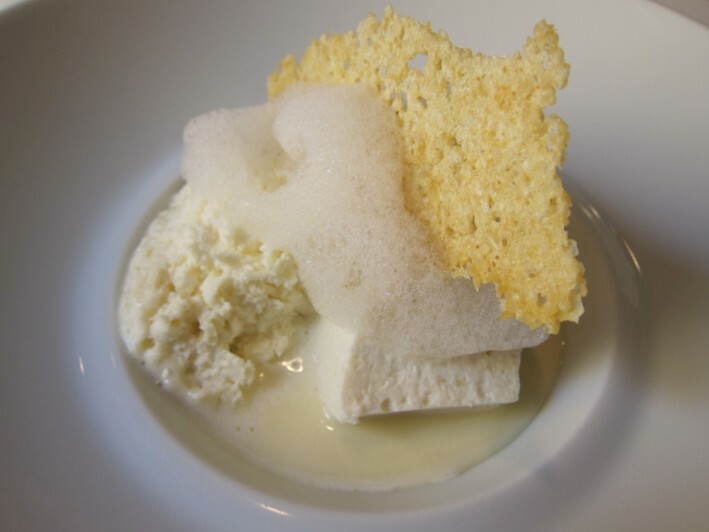 One version of the Parmesan had a sponge-like texture and was fridge cold (the temperature being for me the only fractionally jarring note), with the Parmesan "air" above it as light in texture as its name suggest, the crisp very delicate. This was a very enjoyable as well as original dish, a modern take on the traditional food of the region (19/20). Next I tried morels stuffed with sausage, with a broth of suckling pig, herbs and morel juice, with short strands of pasta made with roots, including celeriac and artichoke. 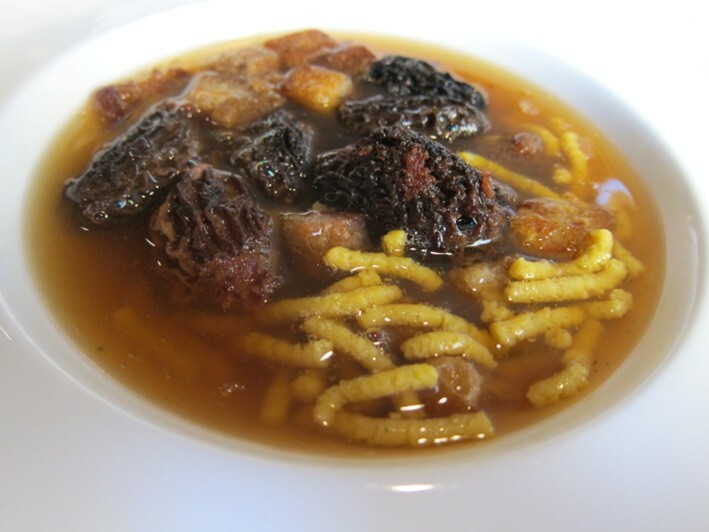 This was a delightful dish, the morels having lovely flavour, working well with their pork filling, while the broth had remarkably clean flavours, capturing the essence of the mushrooms and the suckling pig; the pasta added another textural element (20/20). Conchiglie of monkfish had pasta shells filled with monkfish in a creamy sauce, with tiny pieces of finely chopped carrot and a hint of citrus. The fish was tender (far from a sure thing with monkfish, even in good restaurants) and the pasta nicely made, the citrus providing just enough acidity to balance the dish (18/20). Next was tagliatelle with ragu, a deceptively simple dish. The dough is prepared with a higher than usual proportion of egg yolk, using embryonic eggs to give a slightly firmer pasta than is often made, the finished product beautifully cooked and having lovely texture. 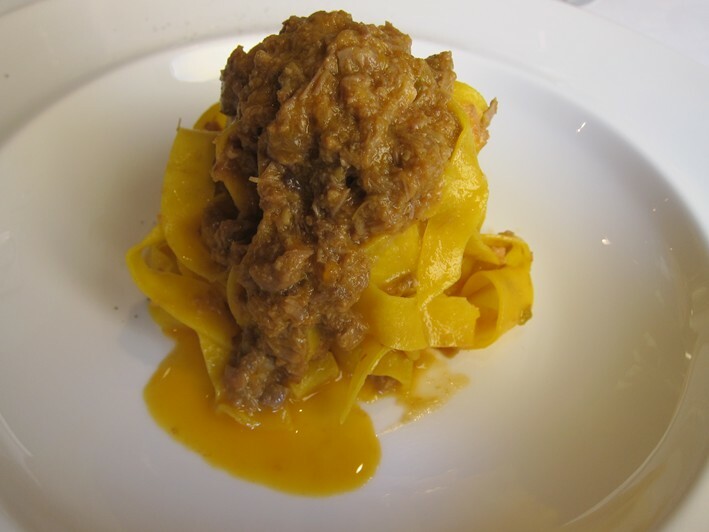 The ragout preparation involved around one third pork sausage that is cooked in a pan without any oil, while the rest of the ragu is cheek, tail, tongue and belly that is cooked separately then beaten and thickened with bone marrow. As a diner you do not need to be concerned with all this, as the end result is simply a beautifully rich, perfectly seasoned ragu with sublime pasta, a really delightful thing to eat. I doubt that this take on the classic dish could be significantly improved upon (20/20). 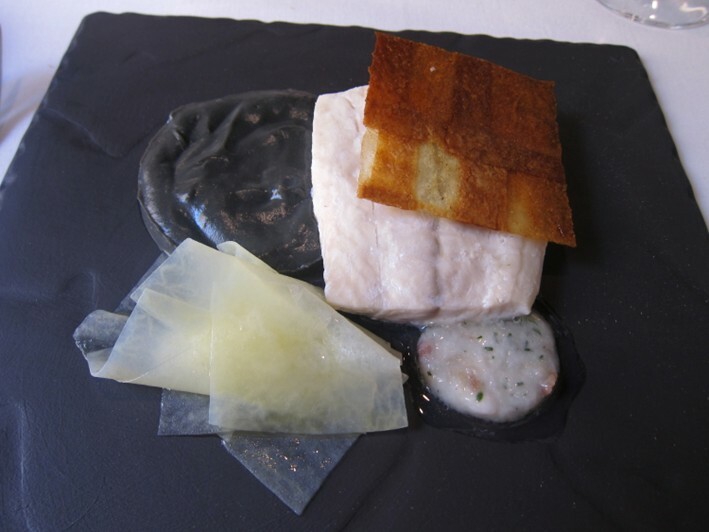 The only dish of the meal that did not work so well for me was turbot, cooked sous vide with drops of extra virgin olive oil and a jus of aromatic herbs, the dish served on a black slate. The fish was accompanied by several textures of potato. Cream of potato was coloured with squid ink, boiled potato was then sliced, and there was also a crisp potato. The squid ink dominated the taste of the potato cream, and as an incidental thing the visual impact of this seemed to me a little lost by serving it on a black slate. The sliced potato did not have a great deal of flavour, though the potato crisp was good and the herb jus worked well. The main problem was the turbot itself, which tasted a little dry. Given the high level of technique on display in the kitchen throughout this meal I can only assume that the individual piece of turbot was not of optimum quality, though it was certainly still pleasant (16/20). The meal was firmly back on track with my main course, the suckling pig, topped with crackling. 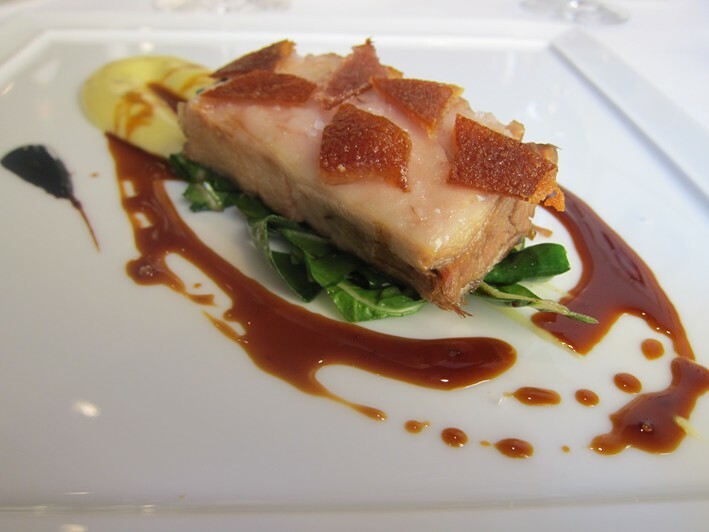 The slab of pork was cooked sous vide in its own juices with aged balsamic vinegar, served on a bed of spinach. The flavour of the suckling pig was simply stunning, its richness carefully balanced by the balsamic, and an extra texture provided by the perfect crackling. So often pork crackling can be a disappointing, rock hard slab, but here it was perfectly crisp yet very light, the best crackling I can recall eating. Again this was a dish that it is hard to imagine making much better, a pork lover's delight (20/20). A small pre-dessert was iced basil with buffalo mozzarella powder, a pesto biscuit and edible flowers. 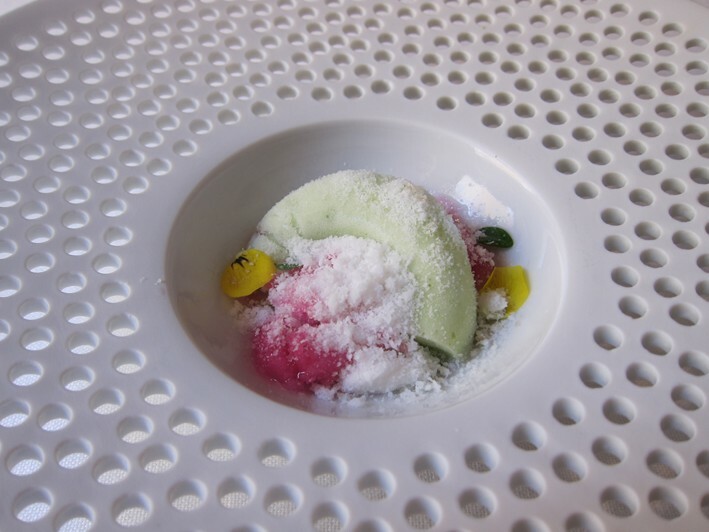 While well made, I am just not fond of shrubbery in my desserts, so I am reluctant to assess this dish. Fortunately the main desserts were back in the world of sweetness. 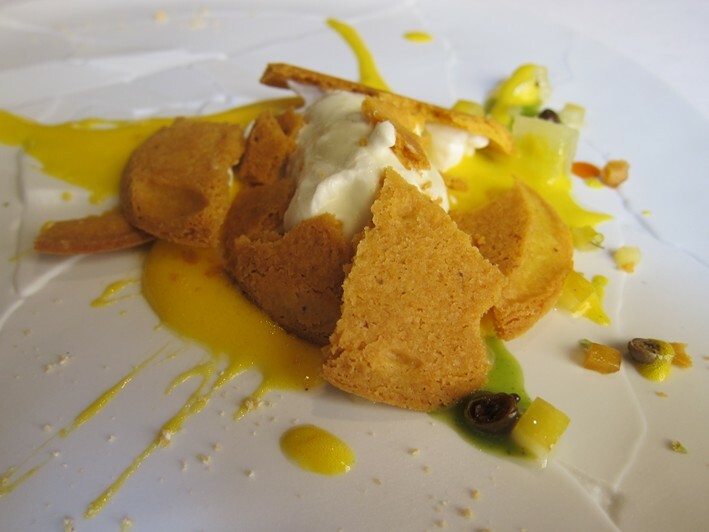 "Broken lemon" tart was just that, the tart broken up when served, accompanied by a scoop of lemon grass ice cream, juice of lemon zabaglione, a little coffee powder, lemon confit and a little chilli oil. This worked well, the chilli mercifully restrained to give just a hint of bite, with the lemon flavour strong enough to handle this unusual addition (18/20). The best dessert was a warm chocolate cake made with local dark cherries from Vignola, which had just come into season. 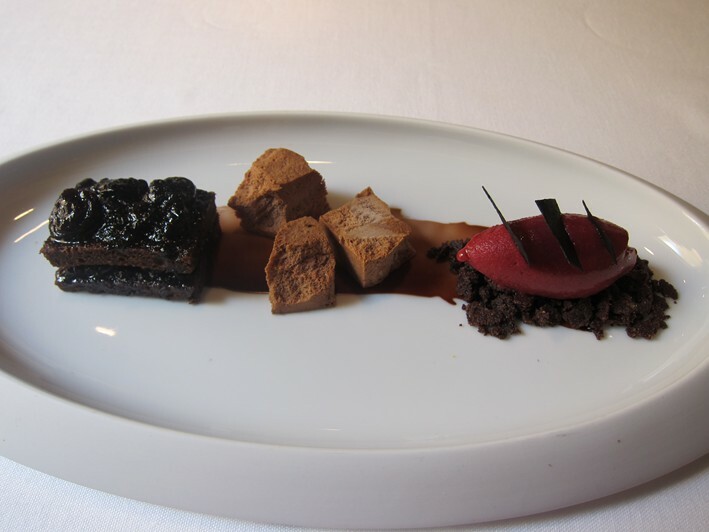 This was sandwiched and topped with cherry compote, accompanied by a mild coffee parfait in cubes, with cherry ice cream resting on crumbs of the cake, the ice cream topped with slivers of chocolate. The flavours were superb, the cherries having wonderful, deep flavour (20/20). Coffee was served with a tea Madeleine, a chocolate truffle with ginger, passion fruit jelly, a chocolate ganache with hazelnut, a small version of the lovely cherry cake featured in the dessert, and a little Bombolona cake with cream. 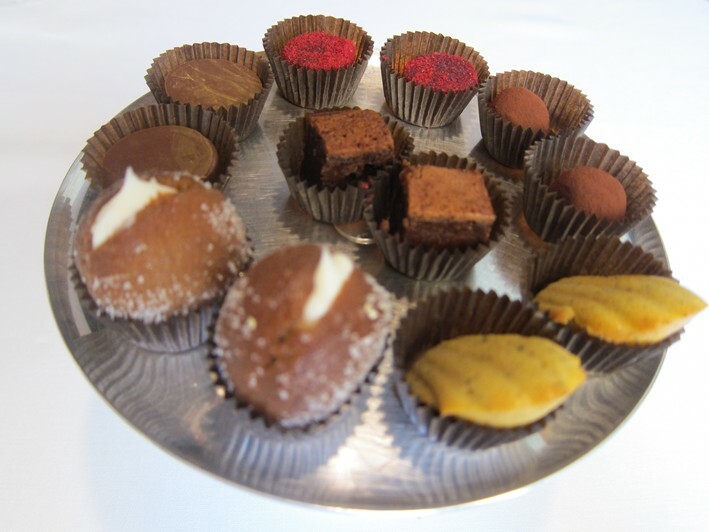 The truffle had distinct ginger flavour and the ganache was superb (at least 19/20 for the petit fours). Service was slick throughout, and the bill came to €235 (£189) a head including wine. At the end of the meal the chef came to chat with us and we were given a little taste of 50 year aged Balsamic vinegar, which was remarkably sweet while still being very much vinegar, an intriguing taste sensation. In the conversation he said that he was now concentrating on cooking dishes that reflect the cuisine of the local region, and he felt that cooking using chemicals to give exotic textures, beloved of many modern chefs, including himself at one time, was now "over" as a culinary phase. Overall this was a very enjoyable meal indeed. A great deal of effort has clearly gone into rediscovering, and in some cases reinventing, traditional dishes of the area, and it was noticeable how many dishes that we tried used produce from this region, such as the Parmesan, the balsamic, the local cherries. The best dishes of this meal were top class. 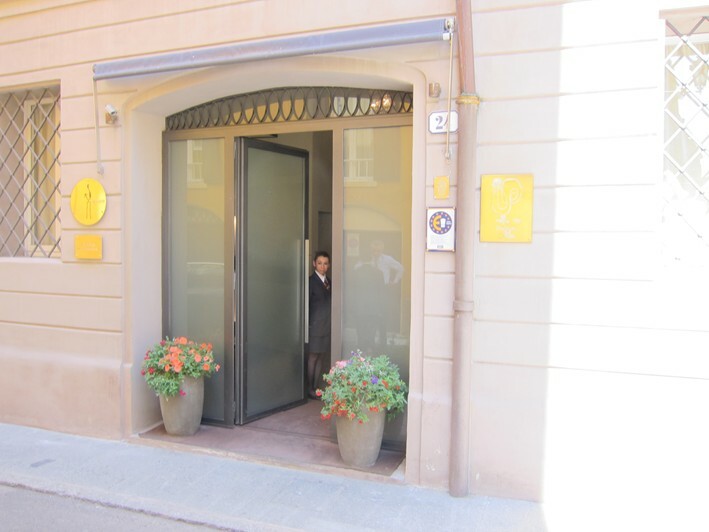 My wife and I had an enjoyable meal here to celebrate my birthday, with Massimo Bottura very much in ebullient evidence in the dining room. My main disappointment in retrospect was the absence of seafood (usually a key element in top level meals I have enjoyed), but it was obvious that this would be the case from the menu that we had chosen! As it was, my favourite dishes were the river eel, the fantastic variations on Parmesan, and a chocolate and cherry birthday cake, which I imagine was a version of the Vignola in your review. I really like mortadella, but whatever the technical brilliance involved in producing the amuse-bouche based on this, I found it difficult to see that it was much more than the sum of its parts; similarly with the ragu which you found so special. 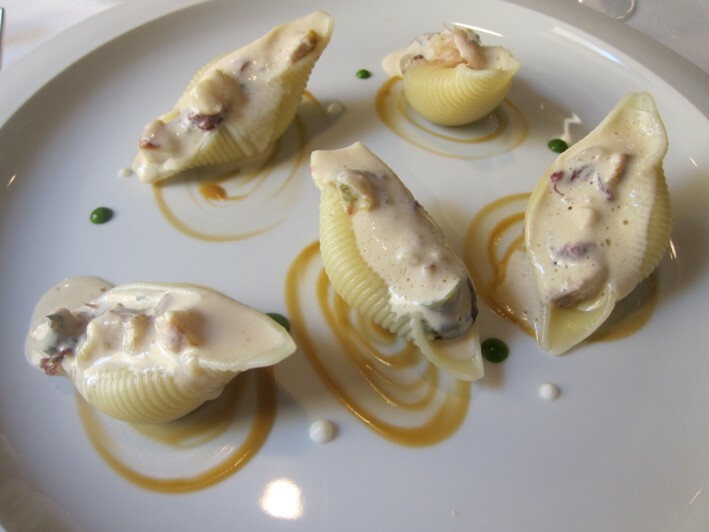 I was surprised at the absence of nibbles - sometimes one of the most interesting parts of a meal - at the beginning of proceedings, and wondered whether this was an Italian thing, but note from your review of Calandre that this is not necessarily the case. Booked here for June but flights are horrendous, nevertheless , ill go on my bike if I have to. Having spent 3 days gorging on fresh pasta in Bologna, I was taken here as a birthday treat. I had not said I am a veggie! This did not stop Mr Botturo to come out to put his area around my shoulder: "we are going to have a very a very exciting evening tonight" which I certainly did. He put together a most exhilarating 7 course veggie menu, evoking the nature along the Po! Magical.